Salman is currently occupied with the work of Bharat. Superstar Salman Khan is currently occupied with the work of his upcoming film Bharat. The cast and crew have reached Goa for the next schedule. Despite being busy, the actor always takes out time for some fun. 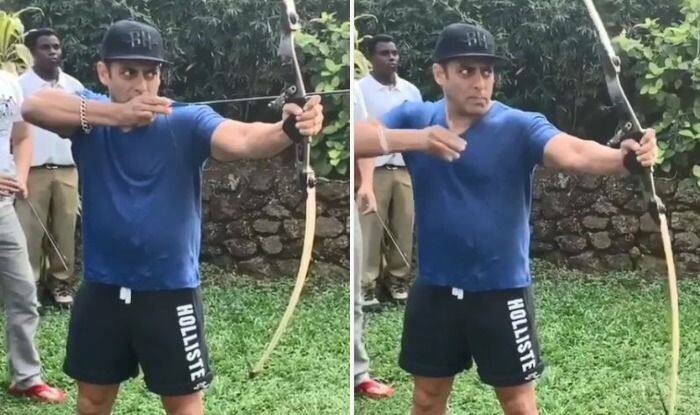 A video has been shared by one of the fan pages in which the superstar can be seen trying his hand at archery. As the crew members cheered for him, he hit the bullseye in the first attempt. Dressed in a casual avatar, the actor looked dapper. Salman’s rumoured girlfriend Iulia Vantur has also joined him in Goa. He recently wrapped up the TV reality show, Bigg Boss and is now focussing on Bharat. The movie also features Katrina Kaif, Disha Patani and Sunil Grover in crucial roles. It is the remake of An Ode To My Father. The movie is directed by Ali Abbas Zafar and is scheduled for Eid 2019 release. Salman and Katrina have earlier worked together in Ek Tha Tiger and Tiger Zinda Hai. Both the films fared well at the box office. Expectations are high from Bharat as well. Before Katrina, Priyanka Chopra was signed as the female lead. However, she backed out due to her engagement with Nick Jonas after which Katrina came on boards. A couple of days back, he shared a video in which he and Shah Rukh Khan got emotional after watching a song from Karan Arjun. Both the stars share a great bond. In fact, Salman was also seen in a cameo in SRK’s latest release Zero. On a related note, Salman is all set to grace the episode of The Kapil Sharma Show with his brothers Arbaaz Khan, Sohail Khan and father Salim Khan. The promos indicated that it is going to be a funny episode.